Digging In The Mud To See What Toxic Substances Were Spread By Hurricane Harvey : The Two-Way Hurricane Harvey dumped 50 inches of rain on parts of Houston. Scientists are now trying to identify contaminants spread by the storm, including those in mud at the bottom of the Houston Ship Channel. 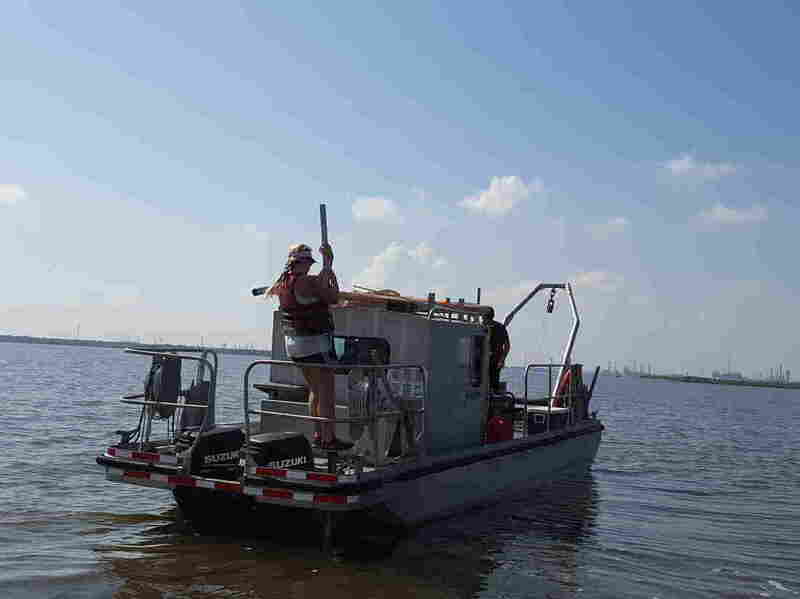 Lindsay Cristides, a master's student in oceanography at Texas A&M University, anchors a research vessel in the Houston Ship Channel before taking samples of sediment left behind by Hurricane Harvey floods. The samples will be tested for contaminants including heavy metals. The floodwaters from Hurricane Harvey had to go somewhere. The storm dumped 50 inches of rain on parts of the Houston area in late August. Much of the water made its way through streets and bayous and eventually drained into the Houston Ship Channel, the busy commercial waterway that allows ships to travel between the Gulf of Mexico and industrial facilities around Houston. In the weeks since, the water has drained away, but scientists believe many of the contaminants it carried have not. "The Port of Houston is saying they had up to 10 feet of storm layer deposited in the ship channel," explains Tim Dellapenna of Texas A&M University, Galveston, who is studying the so-called storm layer of sediment that Harvey left in the bottom of the channel. Sediment can tell scientists a lot about a flood — contaminants get trapped in the mud, and the very amount of mud and sand can reveal things about how the storm played out. "We're actually going to try to do a full screening for dioxins, heavy metals, polyaromatic hydrocarbons," Dellapenna explains. Mercury is a heavy metal. Polyaromatic hydrocarbons are often released by petrochemical operations, like the ones that line the ship channel. Water rises in the Houston Ship Channel on Aug. 27. Some of the largest oil refineries in the world line the channel, which connects Houston to the Gulf of Mexico. Dioxins, in this case, could come from a Superfund toxic waste site nearby. The San Jacinto Waste Pits upstream flooded during the storm, and the Environmental Protection Agency says dioxins may have washed into the channel. Last week, the EPA announced a plan to remove nearly 212,000 cubic yards of contaminated material from the pits to prevent future contamination from floods. Dellapenna's team also plans to compare contaminants in the new layer with those found in previous studies of the mud in the channel. For example, they'll specifically screen for mercury, in part because previous work by a doctoral student working with Dellapenna found elevated levels of mercury in the channel mud. Other toxicology and environmental science teams from Texas A&M as well as Rice University and the University of Houston have also been testing sediment left by the storm, focusing on parts of the city such as Buffalo Bayou, which runs through downtown Houston, and residential areas that were flooded. 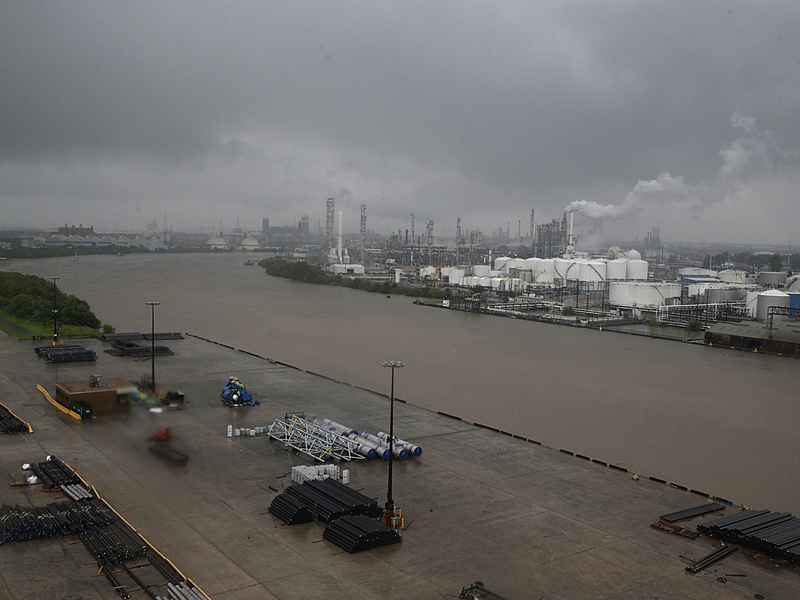 In the Houston Ship Channel, the amount of sediment deposited can also reveal the scale of the storm. The channel is the dredged upper part of Galveston Bay, and it's usually slightly salty. Harvey caused such severe flooding that the freshwater flowing into the ship channel pushed the leading edge of the salty water out toward the Gulf of Mexico. Usually, where the salty water begins, the sediment carried by freshwater ends, so looking at the sand left behind in the ship channel can help scientists understand how far out that so-called salt wedge was pushed. "What we're learning just from today is this is pretty sandy," Dellapenna says, referring to a sediment sample taken from midway up the channel near the Houston suburb of Baytown. "That means the salt wedge had to be pushed down further into the bay." A core sample of mud from the bottom of the Houston Ship Channel. 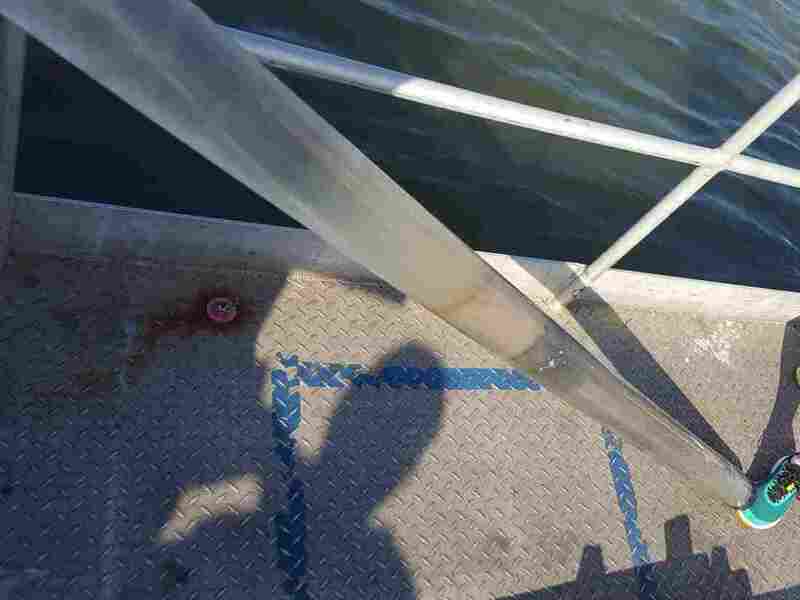 The lightest layer at the top of the tube is about 6 inches of sandy sediment left by the floods after Hurricane Harvey. Taking samples in the Houston Ship Channel can be challenging. The process requires anchoring the small research boat with vertical poles and then using a combination of winches, special coring equipment and muscle to sink hollow tubes into the mud below. "All the barges and tugboats go through there. So just getting to each site will be time-consuming because you have to dodge ships," says Lindsay Critides, an oceanography graduate student at Texas A&M, referring to the enormous oil tankers and other vessels that pass each other in the channel. "We're more maneuverable than they are, so we have to get out of the way." Plus, the newly deposited sediment can be soupy, which makes it more likely to run out of the tubes before they can be pulled back onboard. But after a full day of work last week, the team succeeded in collecting a handful of samples. They showed about 6 inches of sandy mud left behind by Harvey in a part of the channel. Toxicologists at Texas A&M expect to have results from screening the sediment for contaminants by February. In addition to publishing their results in academic journals, they plan to share them with a range of health officials to help them plan for future disasters.